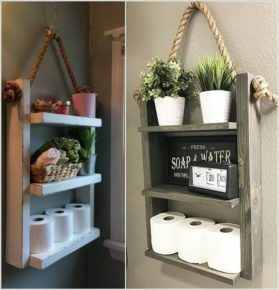 Among the abundance of bathroom projects, designers offer a number of ideas to make improvements for your convenience that you can make yourself. The bathroom is a special place where we stay alone with ourselves and in order to make it a pleasant and comfortable place to stay, you can make yourself some amenities to make it your place. Like this shelf in different colors and solid wood on which to put toilet paper rolls, which always ends at the most inappropriate moment, and why not a clock to not forget yourself in there, or some pots with ornamental flowers. But how will they feel in this place? You can experiment and enrich your knowledge on plant life. The shelves are multifunctional and you can put different items needed for your bathroom. © 2019 Home Decor Image. All Rights Reserved.